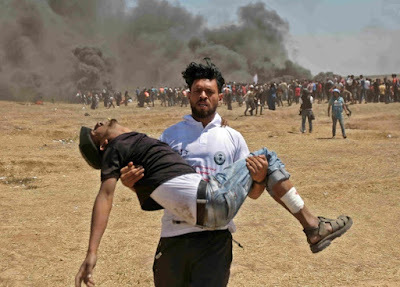 Northern Voices: Gaza massacre - 60 Palestinans killed on Monday! "Insanity in individuals is something rare - but in groups, parties, nations and epochs, it is the rule." (Friedrich Nietzsche). When you hear that seven US governors have written to the Nobel committee nominating U.S. President Donald Trump for the Nobel peace prize, it makes you think that the inmates have taken over the lunatic asylum. That educated idiot, Boris Johnson, the British Foreign Secretary, has also called for Trump to be awarded the peace prize and believes that the U.S. moving its embassy to Jerusalem, "could be a force for peace." On Monday, 60 Palestinian demonstrators were killed at the Gaza border fence, many by Israeli snipers. 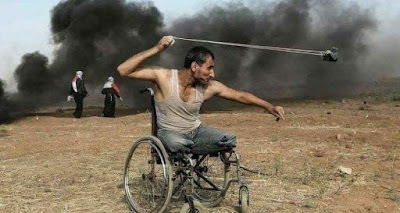 The killings which included eight children under the age of 16 and a double amputee in a wheelchair, who was shot for throwing stones, coincided with the high-profile ceremony to mark the transfer of the U.S. embassy from Tel Aviv to Jerusalem and the 'Nakba' ('catastrophe'), when more than 70,000 Palestinians fled or were expelled in 1948, following the creation of the state of Israel. At least 2,400 people were wounded. Trump called the embassy move a "great day" for Israel and his daughter Ivanka, celebrated the opening to cheering and clapping from American and Israeli VIPs. The foundation of the Israeli state 70 years ago, involved the deliberate ethnic cleansing of hundreds of thousands of Palestinians. Demands for compensation and restitution have been routinely ignored for decades. In what some people see as a provocative act, Donald Trump chose to move the U.S. embassy to Jerusalem on the very day the Israeli's commemorated their state's anniversary and the Palestinians mourned their Nakba. Israel's occupation of the Palestinian territories has now reached its 51st year. The people of Gaza have had to endure eleven years of blockade since they voted in a Hamas government in 2006. Despite being a flagrant violation of international law and an obstacle to peace, the Israeli's continue to expand Jewish settlements on the West Bank and to pursue a policy of ethnic cleansing. UN Security Council resolution 2334, passed on 23rd December 2016 - the U.S. abstained - condemns the Israeli settlements on the West Bank as a flagrant violation of international law; demands that Israel "immediately and completely cease all settlement activities in the occupied Palestinian territory, including East Jerusalem", and seeks a two-state solution to the Israeli - Palestinian conflict. The resolution is entirely consistent with international law going back to 1967, which sees Israeli settlements on occupied land as illegal. There are 430,000 Israeli settlers in the West Bank and 200,000 Israeli's in East Jerusalem, which Palestinians see as the capital of their future state. Despite almost universal condemnation of the expansion of Jewish settlements in the occupied territories, the Israeli's continue with their illegal seizure of Palestinian lands. Two days after the inauguration of Donald Trump as U.S. President, Israel revealed plans for nearly 600 settlement homes in East Jerusalem. 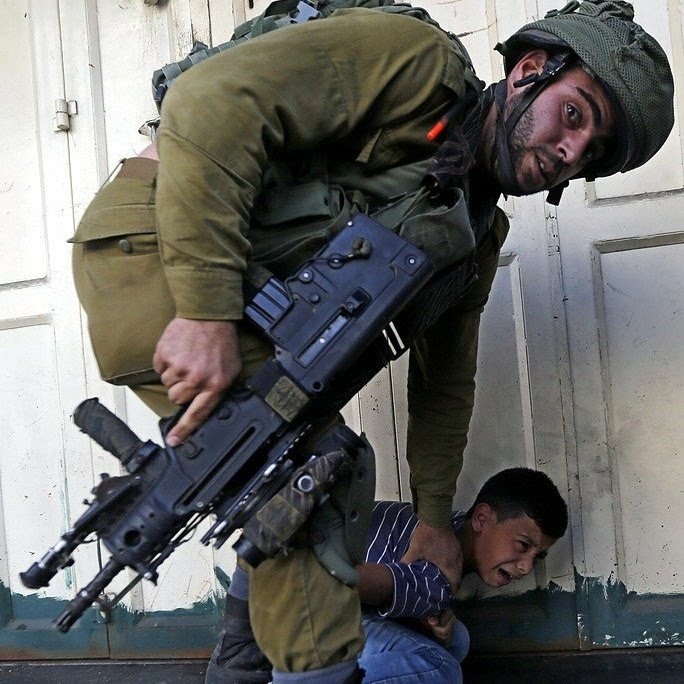 Although many of the Palestinian demonstrators are unarmed and throw stones and no Israeli soldiers have been killed since the protests began in March, Israel's hard- line prime minister, Benjamin Netanyahu, blames Hamas for the deaths of Palestinians and says that every country has the obligation to defend its borders even if these borders are illegal and a violation of international law. Netanyahu says there will be no Palestinian state on his watch. He and is government are addicted to grabbing Palestinian lands and moving in illegal Israeli squatters. In 2014 the Israeli's killed 1,500 civilians, one-third children, using shelling, bombing, drone strikes and sniper fire to kill people in Gaza. In February 2015, the U.S. Congress gave 25 standing ovations to the man (Benjamin Netanyahu), who ordered the attack. The U.S. gives £3.8bn a year to Israel in military aid. The killings in Gaza will intensify demands that the Israeli top brass be prosecuted for war crimes.